The Camera Connection Kit is currently the most useful accessory for the iPad. It opens a number of additional possibilities, far beyond the initial description. A lot of these features have been described at many other places..i.e use it to connect USB keyboards and headsets. But there is one more feature, which I use on a regular basis. I tend to shoot a lot of HD video using Canon DSLRs. I currently own a Canon 550D and also a Canon 7D. Both cameras allow you to shoot video in 1080p. The format used by both camera is h.264, which is also one of the few formats which the iPad can play back without any issues. But according to the specification, only up to 720p. iTunes does not allow you to import higher definition clips. And in any case, if you are on a photo shoot outside your house, you do not always have computer running iTunes at hand, but I tend to have an iPad with me most of the time. This is where the Camera connection kit enters the game. When connecting the SD memory card straight from the camera into the Camera connection kit, you can view and import the pictures directly to your iPad for viewing and verification where ever you are. 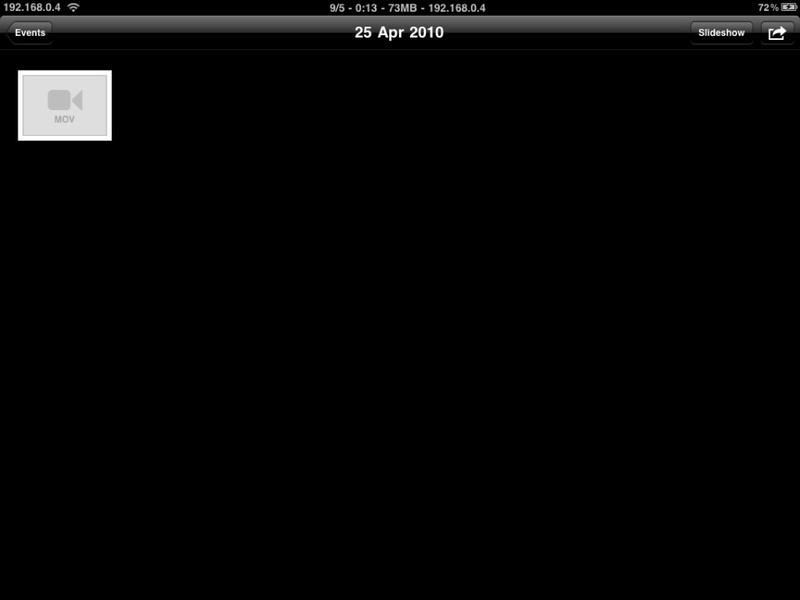 The same is true for the video clips, but unfortunately they are stored also in the Photo application on the iPad and can not be played back, as shown on the picture below. This is where the fun begins. You will need to Jailbreak you iPad to proceed. There are plenty of guides explaining how to do this out there, and it is very easy. But of course, I do not take any responsibility if you screw up you iPad. Proceed at your own risk. Once you have completed the jailbreak, and have Cydia installed, you have several options. My preferred option is to install iFile, which is a very nice Filemanager for the iPhone and iPad. It runs as root user, and as such has access to the whole filesystem, which is why Apple would never allow it in the Appstore. 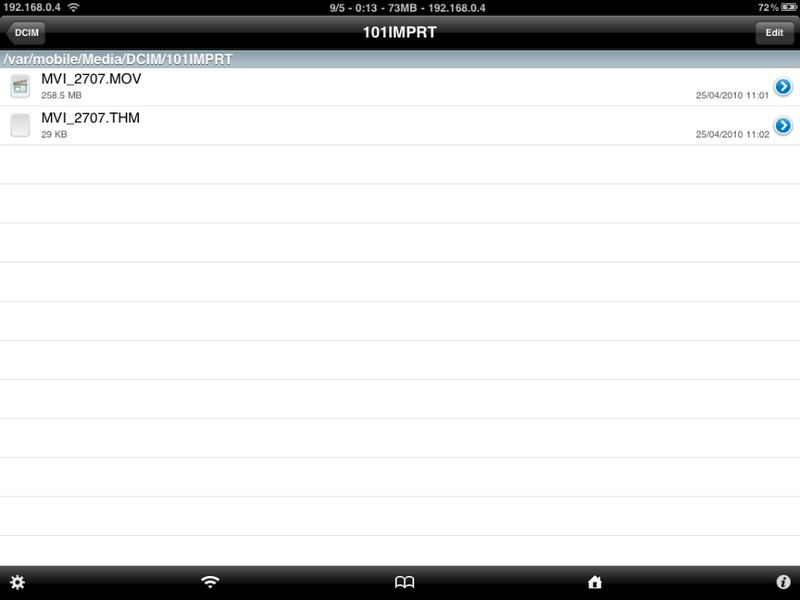 Once you have installed iFile, navigate to “/var/mobile/Media/DCIM”. This is the folder used by the Photo application to store the imported pictures and any other data selected during the import, which means also the Video clips, as you can see below. Each import process will create a separate folder, containing the imported files. As you can see above, I imported a single movie clip. Click on the .MOV file to launch the video viewer, and you will see the video in excellent quality. There might be some issues during playback for the first few seconds, but after that the video plays fine without any problems at all. This is a perfect way to preview and verify your HD videos out in the field on a nice big screen without any need for conversion. Perfect for anybody with a Canon DSLR shooting Video. The above works perfectly fine for 1080p videos created with the 550D (Rebel T2i) and also the Canon 7D. Since the 550D uses SD cards, you can directly stick them into the SD card adapter which is part of the Camera Connection kit. Since the 7D uses Compact Flash cards, you can simply connect a USB card reader to the USB adapter to import the Videos. This entry was posted in iPad, Photography, Tech Stuff and tagged 1080p, Canon 550D, Canon 7D, Canon DSLR, iFile, iPad. Bookmark the permalink. Excellent find there! I would never have figured iFile could play a 1080p video file transferred straight from the 7D with the Camera connection kit, thankyou! Just wondering if you have any problems transferring multiple jpg files from the 7D to the iPad. Does the transfer stop/freeze when transferring more than 10 files at once? This may give me a way to get video clips from my HD Flip directly onto the iPad and verify them. I know the videos are playable – GoodReader and Dropbox will play them, but I can’t get to them via any other applications I think due to the restrictions you mention in your post. I have a CCK on order, so when that shows up, I think I can just carry my iPad and Flip around and manage the files that way. One other question – do you know of any good apps that will edit those videos on the iPad? Jailbreak requirement is fine with me, but I haven’t seen anything about video editing mentioned when I look into Cydia. I did look at ReelDirector (an app in the iTunes store), but it only allows low-res project editing – nothing in 720p (Flip resolution). Do you think the iMovie app that Apple is putting out for the iPad will allow editing of higher res videos? My guess is not, since none of their other native apps support it on the iPad. So I guess I have to look for (hope for) a Cydia-available HD video editing app? great article! 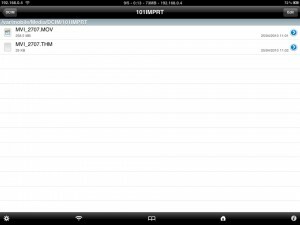 do you have any experience with using iPad as a live view / preview for Canon 7d when shooting video? This also works straight from the SD card, no import required. I’ve been watching stuff today straight off a Class 10, Transcend 16GB card. Exciting stuff! "You ever notice all of the self-sacrificing women in history, Joan of Arc, Mother Theresa...can't think of any others, they all die alone. Men, on the other hand, get so much tang it's crazy."